Downloaded by more than one hundred leaders at Fortune 500 companies! Accelerate your leadership: Expand, Zoom, Focus and Balance! There are three critical dimensions that balanced leaders pay attention to in order to mobilize teams, focus on the future and deliver results more consistently and effectively than their peers. 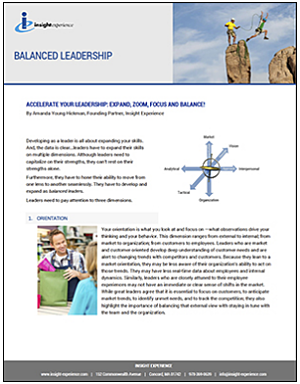 This white paper examines the three dimensions, shares research findings from multiple sources, and explains why and how leaders can develop balanced skills and perspective. Yes, I want to read the White Paper!